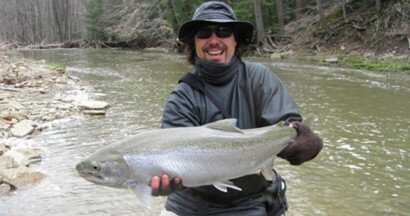 Author and Publisher, George Douglas has just completed his latest fly fishing project! Five hundred years of experience compiled in one amazing book—the stories, techniques, and flies of the top American & Canadian Fly Fishing Guides. We’d like to refer to them as the “Sweet Sixteen”…April Vokey, Loren Williams, Scott Howell, Lori-Ann Murphy, & Josh Nugent just to name a few. The foreword is written by Dec Hogan — and all the step by step fly patterns were recreated and photographed by Dec Hogan and Marty Howard.